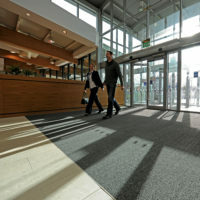 We often see standard carpet tiles, like those in offices, used at the entrance of a building instead of an entrance mat. Discover why that's a problem. At the Stafford South Services, it was important to eliminate hazards to visitors by trapping water, dirt and debris at the entrance of the building. 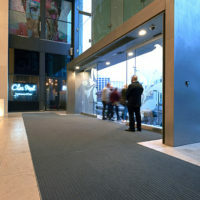 CS supplied a collection of high-end, modular entrance matting solutions to protect the gorgeous tiled floor throughout the Mailbox. 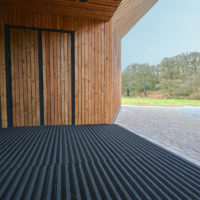 Discover why permanent entrance matting is a better, more effective solution to dirt and moisture being tracked into a building. 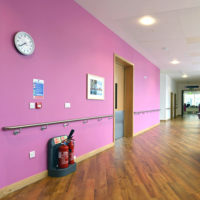 Bristol’s £430 million Southmead Hospital has received a comprehensive protection solution package incorporating many of CS’ world renowned products. 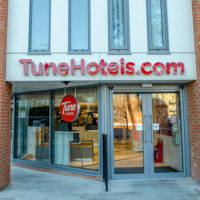 To achieve a durable, spatially efficient solution to protect the walls in their hotel rooms, Tune Hotels chose CS Acrovyn Sheet.